You'll love the soft, clean curves and modern, rounded styling of the Chateau line. There are hot and cold colour indicators on the acrylic knob style handles. The chrome finish creates a bright, highly reflective, cool grey metallic look. This trim kit requires MOEN valve 4792, 4793, 4794, 4796, 4797, or 4798 to complete installation. Voss Two-Handle High Arc Roman Tub Faucet in Oil Rubbed Bronze (Valve Sold Separately) Crisp edges and uncomplicated style features give the Voss collection an ageless, yet fashion-forward, presence. Each silhouette brings a confident transitional style to the bath. 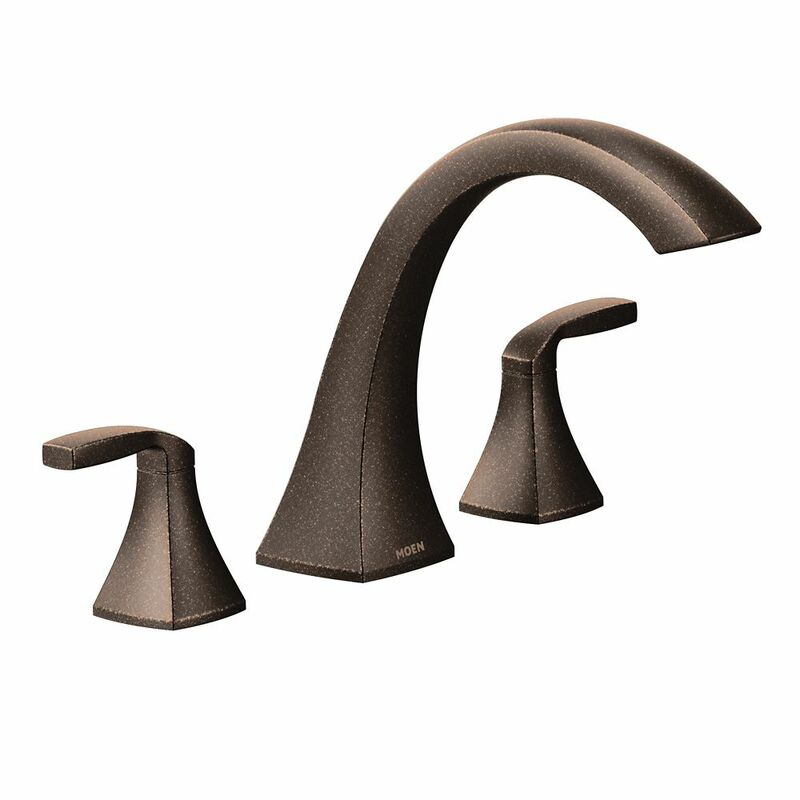 Voss Two-Handle High Arc Roman Tub Faucet in Oil Rubbed Bronze (Valve Sold Separately) is rated 5.0 out of 5 by 3. Rated 5 out of 5 by JimOhl from After a call to Customer Service for help, I... After a call to Customer Service for help, I was able to install this kit with no problem. Rated 5 out of 5 by MrsColeForever from Beautiful faucet and great quality. Beautiful faucet and great quality. Rated 5 out of 5 by MikeB45 from Looks good on my whirlpool tub. Was easy to install. Again another very well made product from Moen. The only problem when I turn the handles for water they go in opposite directions. I had round handles before so it wasn't noticable. But I'll get used to it. Replaced a Moen faucet, just wanted different style and color.